The Derby of 1875 was won by Prince Batthyany’s bay colt Galopin, trained by John Dawson and ridden by John Morris. Lord Aylesford’s Claremont was second and Viscount Falmouth’s Remorse third. Galopin, bred by Mr William Taylor Sharpe and foaled in 1872, won all of his five races in 1875. He was later very successful at stud. Samuel Henry Gordon Alken, also known as Henry Alken Jnr, was born in Ipswich, the eldest son of the leading sporting painter Henry Thomas Alken Snr (1785-1851) and his wife Maria Gordon. He spent most of his career in London. 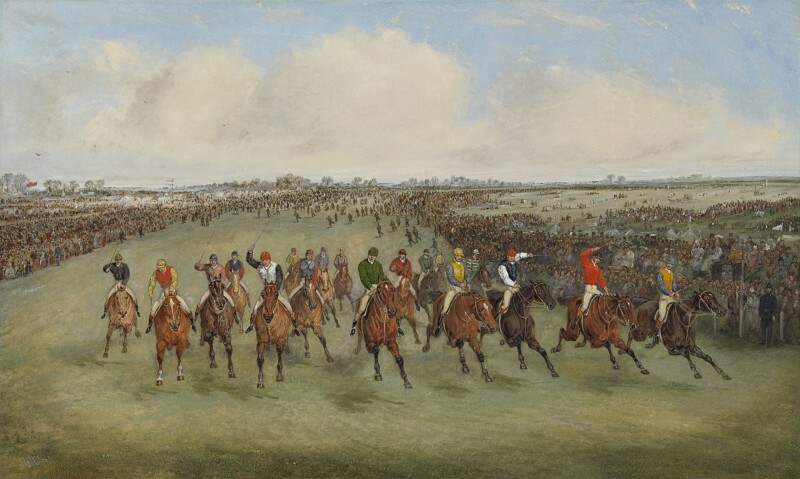 Samuel was a painter of racing, foxhunting and coaching scenes in oil and watercolour. Although he was considerably influenced by the work of his father, his pictures are generally more colourful and detailed in handling. Several prints were published after his work, including The last steeplechase held at the Hippodrome Racecourse, Kensington. He painted many of the horses in George Sala’s 60ft long panorama of the funeral procession of the Duke of Wellington in 1852. Samuel Henry Alken was living in Shadwell in 1881; he died in the Poplar workhouse in 1894.